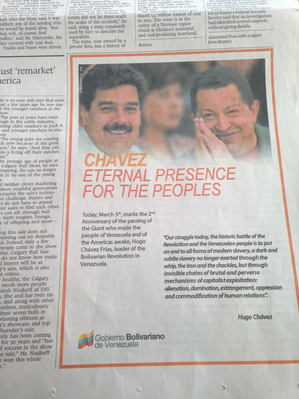 Yesterday, to commemorate “Chávez Day,” the government spent countless dollars on ads in several of the world’s newspapers. The version that came out in Canada’s The Globe and Mail contained the typo “the peoples” in its main title, a huge embarassment for the government. Since nobody saw much point in buying anything abroad to sell for just $2, people mostly pocketed the twenties and the imports never showed up on store shelves. And if any item did hit the shelves, whether it was a $2 box of diapers or a $2 sack of flour, it could be sold for $6 on the black market — so standing in line at the shops became a job.